1 - 70020 between Hazelmere and Liphook on a railtour, 1964. 2 - 70035 departs Perth, 1966. 3 - 45474 pilots 70010 departing Girvan with a boat train for Stanraer, 1966. 4 - 70028 climbing Shap, 1966. 5 - 70000 departs Birmingham New Street (on-train). 1965. 6 - 70015 departs Leeds City with a parcels train, 1965. 7 - 70039 climbing Shap with a fitted goods train, 1966. 8 - 70018 climbing Shap banked by 43027 and 43121, 1966. 9 - 70041 departs Perth, 1966. 10 - 70011 at Ais Gill Summit ust before midnight in gale-force winds, 1967. 11 - 70041 at Shap Summit with a parcels train, 1964. 12 - 70038 climbing to Standedge Tunnel with a mail train, 1965. 13 - 70015 running light-engine between Holbeck Shed and Leeds City (on the footplate). A film crew is onboard, and the comments of the driver are recorded. 1965. 14 - 70014 passing Tebay, 1966. 15 - 70018 at Scout Green, banked by LMS 2-6-4T no. 42154. 1966. 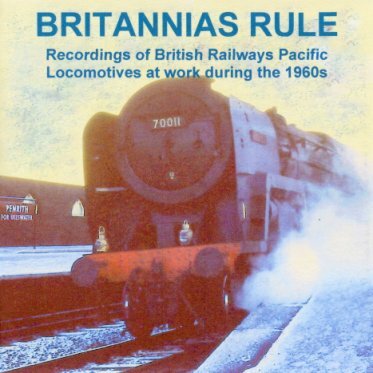 16 - Unidentified Britannia piloted by LMS Class 5 at Barrhill, heard just before day-break. 1966. 17 - 70052 passing Tebay, 1965.